Elkader City Hall is located at 207 North Main Street, Elkader, IA 52043; phone: 563-245-2098. Photo: J.C. Stemmer House, ca. 1879, 113 Oak Avenue NW, Elkader, IA. Listed on the National Register of Historic Places in 1976. Photographed by User:Kev319 (own work), 2014, [cc-by-3.0 (creativecommons.org/licenses/by/3.0)], via Wikimedia Commons, accessed March, 2016. Elkader, seat of Clayton County, was in 1845 named for an Algerian chieftain, Abd-el-Kader, who was then making a valiant defense against the inroads of French imperialism in his country. At that time the attention of the whole world was turned toward Algeria. The first Glass Schoolhouse in Iowa was built here in 1936. The walls of this two-story building (which is 173 feet long and 148 feet wide) are composed of hollow glass blocks 8 inches square and 4 inches thick, laid on edge in much the same way as building bricks in older structures. Corrugation on both sides of the blocks makes them translucent, admitting a maximum amount of natural light without glare and with proper diffusion. Glass walls shut out noise and provide insulation against extreme heat and cold. The building, costing $148,000, and financed by insurance from the previous building (which burned in 1936), a bond issue and P.W.A. funds, provides accommodations for 500 pupils from the third grade through high school. The cantilever type of floor construction was used, with floors of asphalt tiling and metal lath, plastered and then painted. Desks and tables in classrooms and laboratories are of chemically treated hard rubber. Oren R. Thomas, the school's architect, born in 1896 in St. Joseph, Missouri, received his professional education at the Armour Institute of Technology in Chicago, and came to Des Moines, Iowa, in 1918, where he has specialized in the design of school buildings. 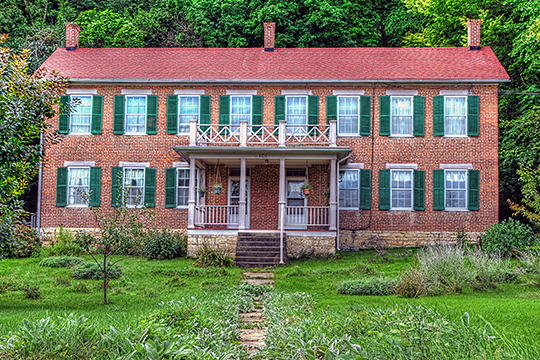 Elisha Boardman and Horace D. Bronson, partners, said to have been the first white men to cross the Mississippi River from Prairie du Chien, Wisconsin, to McGregor, built the first log cabin here on the site of the present railroad station.